On the 28th of April the archipelago season officially begun and so have the sailing routes from the city center with it. If you happen to like natural scenarios by the water, historical spots and most of all, if you love beer, Fjäderolmarna, Stockholm’s first archipelago island (only a 20-minute boat trip from downtown) is the island for you. Fjäderholmarnas Bryggeri and pub is right at the dock, so it’s impossible to miss: more likely you’ll be fooled by the sign “Free beer (tomorrow)” visible from the boat as soon as you approach the island. Jokes asides, there’s no free beer, but every Saturday from 13:00 to 15:00 it’s possible to peek behind the scenes and join a free guided tour of the brewery. The tour ends in a cave (a real one, right behind the pub) that once hosted the island’s aquarium and that is now used as storage for malt and beer batches. 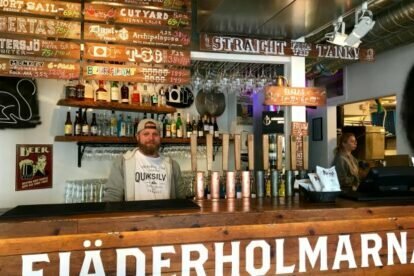 The brewery opened in 2014 and since then it has brought local craft beer directly from the tap to the counter: lager, IPA, porter and a few “guest beers” from other Swedish breweries. Together with the beer, Fjäderholmarnas Bryggeri also offers food and light snacks tailored to specific beers. It’s a perfect spot for a one-day trip out in nature to enjoy the local beauty and local drinks.